Sedapnya makan, sampai tak pandang belakang! 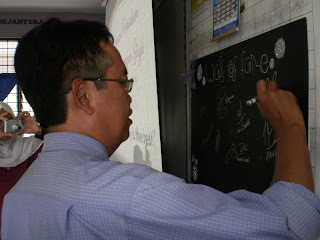 Our PK, among the VVIPs, signing the Wall of Fame. 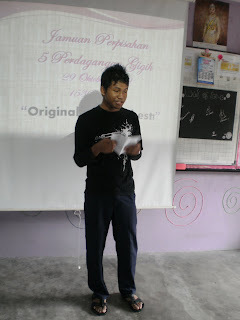 My class monitor, Mohd Izmil Hadi delivering his welcoming speech . 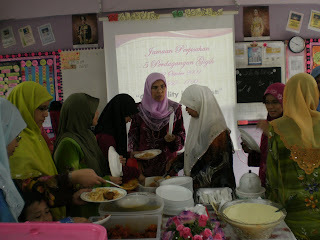 The VIPs, the subject teachers of 5 Perd Gigih. 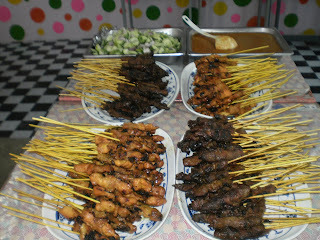 The famous Satay Kajang, among the menu. Chocolate cake, my fruit cocktail pudding and cocktail among the dessert. Salam and greetings to all. Next week will be the last week of school for my school as the Unit Peperiksaan & Penilaian will be arranging the classrooms and hall for the SPM examination which will begin on 18th November 2009. Next Friday the Form 4 students will be off, back to their home for the end of the year school holidays. And on the 16th November, many of the teachers will be out for the Taklimat Pengawas SPM. So, who is there to teach or even to relief the teachers? And some will be away, attending a course, at that time just like me! 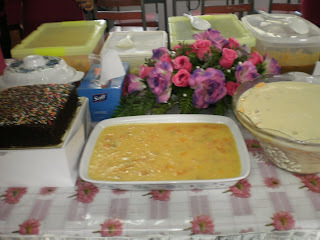 Recently, my class had organised their Farewell Party, on the 29th October. They really wanted to have the party as last year, they did not have the time to organise it. Besides, this year is the final year for them as they'll be leaving the school soon. As a form teacher, I have no problem with that as long as they agree with my terms and regulations. I left everything to them, to plan, to organise, etc. So, they had their own committe members and each committe has their own role to play. As for my part, my job is to order the food. The rest, I leave it to them! I was quite surprised when they came up with slide presentation about the class and also The wall of Fame, where the subject teachers were asked to sign a big card on the wall!For you information, the expenses for the class farewell party was from the money that my class won from Program Jiwa Murni last year and this year! To all my beloved students, ' Thank You Very Much' for giving me 2 years of great moments in my life! 'Thank You' for being such good and wonderful students to all your teachers! I am very proud of you! 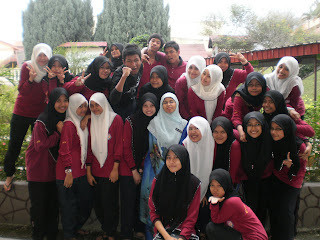 I wish you all the best in your SPM and may success be with you! I love you all very much! 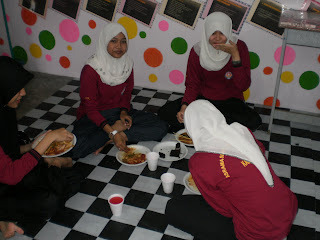 wah, bgs betul anak2 murid kak myza. jenis bleh diharap la ek! Salam Myza : hemmm, betul2 istimewa lah.... murid menghargai apa yg kita lakukan utk mereka....Salute to them..